Kayden Lagana (centre) on top of the podium after winning his category in the Netherlands. 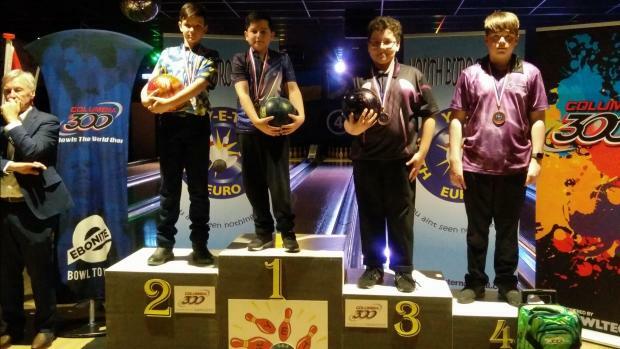 Five Maltese young tenpin bowlers flew to the Netherlands to take part in the YET Open International Scratch Tournament. The team was composed of Philip Gruppetta, Matthew Magro, Juliana Bonanno, Dylan Santillo and Kayden Lagana. All five bowlers managed to make it to the final stages of their respective categories. The Maltese bowlers scored some high scores in the final stages of the competition. Gruppetta compiled a 258, Magro scored 255 while 11-year-old Lagana racked a personal best score of 247. Lagana bowled a 185 average in the final stages to set up a best-out-of-three final against Ukrainian Andrew Gadiatskyi. The Malta U-12 champion went on to clinch the title when he won the first and third game to pick up his first international tournament win. Gruppetta ended his committements in 10th place from 28 bowlers while Magro was also tenth in his category which saw the participation of 45 bowlers. Santill finished 11th from a field of 23 bowlers while Bonanno ended in tenth place from 19 participants.